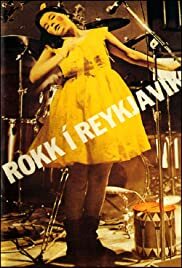 Rokk i Reykjavik is a documentary about Icelandic rock groups of the eightees, where bands like Ego, Tappi Tikarass (Bjorks first band), Q4U, Fræbbblarnir, Purkur Pilnikk and many more are filmed live. It also includes interwiev´s with some band members and common people with attitude. Anarcy is the main word! The title of the movie isn´t right thought, because it should have been called Punk in Reykjavik, because the bands performing in the documentary are actually all punk bands. Punk hit Iceland like an atombomb in the eightees, actually four years later than the wave struck other Vest-Euorpean contries. The film is a must see for all punk fans and fans of Bjork, because it´s really weird to see her as a little girl performing in a punk band.